Some songs are catchy ditties that are quickly forgotten. Others capture pivotal moments and reside deeply within the soul. 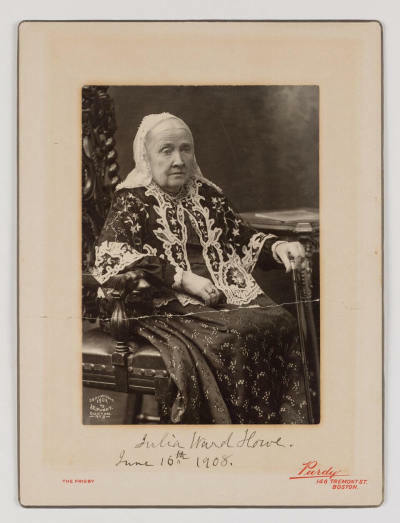 Julia Ward Howe's "Battle Hymn of the Republic" is one of those songs, and the delicate remains of its manuscript will soon be housed at the Museum of the Bible in Washington, D.C.
More than 150 years after its conception, the "Battle Hymn of the Republic" still resonates. Awakened from her sleep by the inspired words, Howe scrambled to jot them down while she resided at the now historic Willard International Hotel during the first year of the Civil War. Last week, the manuscript was returned to its birthplace where visitors could catch a glimpse of it during its limited two-day appearance at the prestigious hotel. "We had an opportunity to bring it to the Willard and just took the chance for a couple of days to publicly display it," said Jeremy Burton, the museum's director of communications, in an interview with The Christian Post. Burton added that the manuscript will become a fixture in the museum's collection. 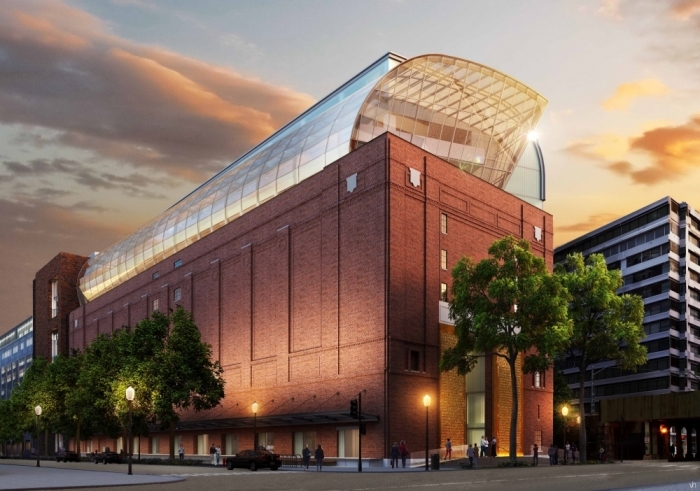 The Museum of the Bible plans to place the manuscript in its Bible in America exhibit on a floor of the museum that will solely focus on the impact of the Bible. "The 'Battle Hymn of the Republic' quickly became an American classic and has remained so ever since," said Museum of the Bible President Cary Summers in a statement shared with CP. "It's a powerful example of how people throughout the ages have been influenced by the Bible." The hymn is deeply rooted in the Bible and captures the essence of the bloodiest battle in American history between the northern (Union) and southern (Confederate) states during the Civil War where an estimated 750,000 soldiers died. It is widely speculated that when President Abraham Lincoln first heard "The Battle Hymn of the Republic" sung at a large rally, tears filled his eyes and he requested that it be sung again. The famous hymn resounded once again during another pivotal battle for civil rights in America: the 1960s Civil Rights Movement. At the very epicenter of that movement was civil rights icon the Rev. Dr. Martin Luther King Jr. who used words from the first line of the 'Battle Hymn' in what would be his last speech. "Mine eyes hath seen the glory of the coming of the Lord," King said in his signature cadence to a cheering crowd. He later made reference to the biblical figure Moses who helped lead the Children of Israel through the wilderness to the Promised Land — though Moses was never able to inhabit it. King said, "I've been to the mountaintop ... I just want to do God's will, and He's allowed me to go up to the mountain. And I've looked over and I've seen the Promised Land. I may not get there with you, but I want you to know tonight that we as a people will get to The Promised Land. ... So I'm happy tonight. I'm not worried about anything. I'm not fearing any man. Mine eyes hath seen the glory of the coming of the Lord." Julia Ward Howe, on her trip to Washington, D.C. more than 150 years ago, penned her famous battle cry after encouragement from the Rev. James Freeman Clarke, with whom she was traveling, along with her husband. Although Howe is best known for writing "Battle Hymn of the Republic," she also wrote poetry and social critiques, and was involved in abolitionism and women's suffrage. 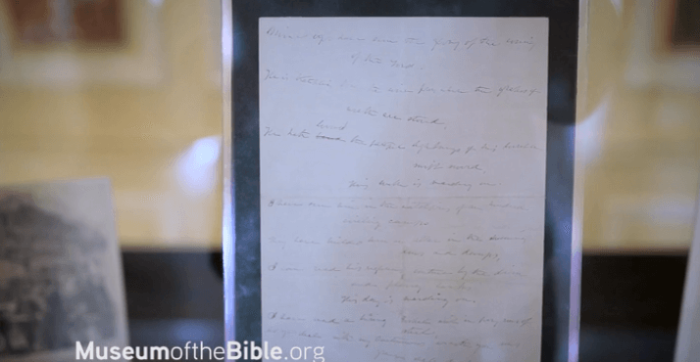 The original manuscript of "Battle Hymn of the Republic" can be seen at the Museum of the Bible, which opens on Nov. 17, 2017.